You could hear a pin drop in my house today. It seems very quiet and empty without my lovely children who all piled off to school this morning. But I have had lots to do and naturally I am able to work much more efficiently when they're not here! Today I'm going to show you a card made with the beautiful stamp set Touch of Nature. I could hardly believe it when I saw this set on the Last Chance List but it's true - Touch of Nature is only available until the end of this month! Stamps like the ones in Touch of Nature are perfect for the sponged and stamped cards like this one that I'm so fond of making. Cut a 9cm x 7.5cm piece of Whisper White card stock. Stamp the bird branch first and then stamp just the leafy sections of both branches around it in Chocolate Chip ink. Colour you images using a variety of inks and a blender pen. Sponge Old Olive and Garden Green ink around the edges of the card stock over the leaves. Sponge Chocolate Chip ink round the edges of the card stock - this will intensify the lighting effect. Stamp a few branches in versamark ink onto an Old Olive card blank and mount the panel onto the centre. The branches from the set are so handy! Here's one of the branches with the apple from Tart and Tangy. And here it is again, cut out this time, with the lovely fox from Fox and Friends. Look at that gorgeous designer paper! That's on the Last Chance List too - grab it while you can before it's gone for good at the end of the month! Chocolate Chip ribbon won't be available after September either... what am I going to do without that?! Here's the butterfly from the set looking fabulous in Elegant Eggplant and Pink Passion. Don't forget that lots of the colours are retiring to make way for the exciting new Stampin' Up colours - check the Last Chance List to stock up on your favourites. 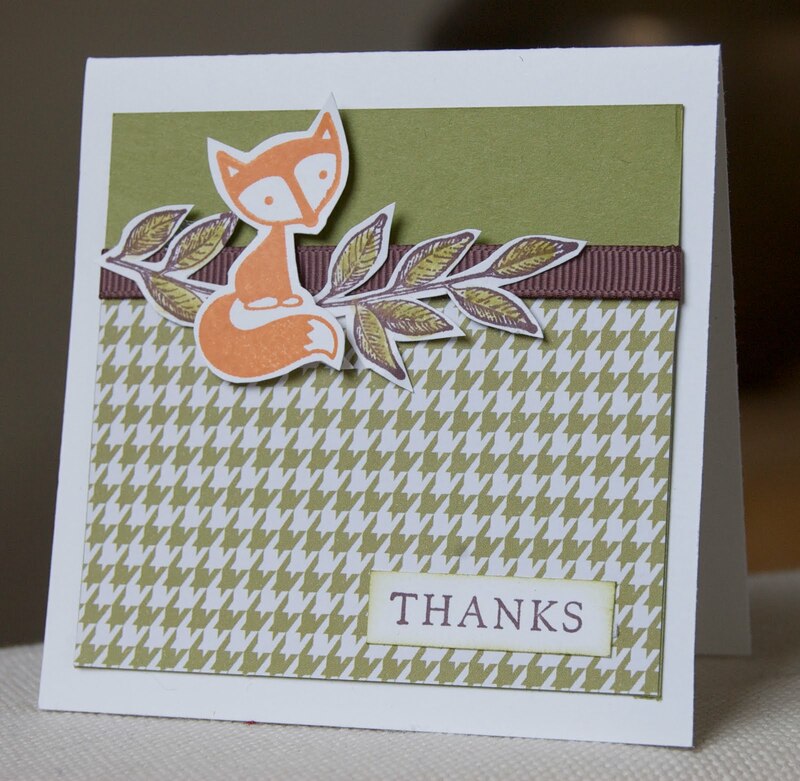 Here's a card using the delicate fern stamp - the image is strong enough to use on a one layer card. If you're interested in Touch of Nature or any of the other stamp sets and accessories on the Last Chance List, my advice is don't delay as they do go very quickly. Check the Last Chance List here! To order, just drop me an email when you've chosen your items. I'll have more cards here for you tomorrow. So great- I just love your little "scenes"...and you make it sound so easy Lol!! All these cards are gorgeous. Love your touch of nature card, the blending is gorgeous. I bought this set as soon as it appeared in the SU catty a few years ago. I still love it although I don't use it often anymore. I really like how you added all the branches to make this a "bird in a tree" design. All your other cards using this set are so creative.